Will AIA (America Invents Act, 2011) be repealed? Recently a bill “Restoring America’s Leadership in Innovation Act of 2018” was passed in House of Representatives of the United States of America that triggered a widespread speculation amongst the IP community in the US. The raison d’étre for introducing the bill, by Congressman Thomas Massie on June 28th, was to repeal the Leahy-Smith America Invents Act (AIA), 2011 and revert back to the patent law which was in existence before the AIA was enacted. To properly understand the reason for dissent with the AIA is by comprehending the significant legislative changes introduced in the US patent system by this Act. The major reform brought by this Act was the introduction of the First-Inventor-to-File system replacing First-to-Invent, thereby eliminating interference proceedings while ushering in newly introduced mechanisms like derivation proceedings, Post-grant review (PGR), and IPR (inter parte review + inter parte reexamination) under the administrative ambit of the refurbished Patent Trial & Appeal Board (PTAB). Moreover, one of the most talked about reforms was the amendment of 35 U.S.C. Code 102, thereby debarring sale, or commercial use/disclosure from the list of exceptions which were eligible for a grace period of 12 months before the filing date. The rationale behind implementing AIA was to create a streamlined patent process at the USPTO (the United States Patent & Trademark Office) by eliminating unnecessary hiccups or proceedings during prosecution stage; and also harmonize the US patent law with other countries. However, an International IP Index released by the U.S. Chamber of Commerce Global Innovation Policy Center (GIPC) suggests otherwise. 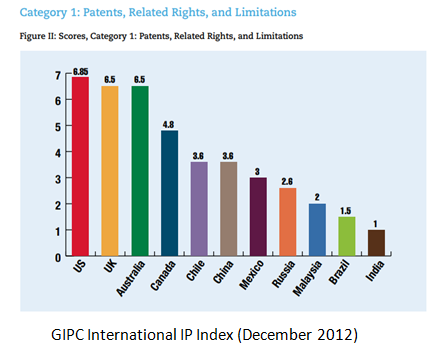 One can cite various factors influencing this index but the take away is US slipped to 12th position in the latest Global IP Ranking (Patent) for lack of effective initiatives taken by the government as compared to its counterparts in different nations. This is why the advent of the Thomas Massie’s bill holds reasonable grounds. Per its own findings (Section 2 (2) of the Bill), it is argued that the amendment made by the AIA and a few decisions given by the Supreme Court (SCOTUS) on IP-related cases have harmed the progress of Science and useful Arts by eroding the strength and value of the patent system. In its’ 13 sections, the bill strongly advocates the repeal of AIA act and amendment brought by this Act, like IPR, PGR; reverting to patent legislature which was in existence pre-AIA; creating a platform for promoting computer-related inventions, life science discoveries or similar inventions/discoveries; and abrogating the adjudicatory power of PATB on invalidating an issued patent except in an ex parte reexamination under Chapter 30 (35 U.S.C.). The Bill puts forward many arguments in favor of the above-proposed amendments. Firstly, it champions the First-to-Invent system over the First-to-File system. Under a first-to-invent regime, there was the interference proceeding under which only a true inventor was guaranteed a right for her invention. This was decided by BPAI (Board of Patent Appeals and Interferences), But in the post-AIA regime, a first-to-file system was introduced and a derivation proceeding was initiated to establish true inventor rights. This creates an apprehension among the inventors to share their invention with anyone on fear of losing her right and also to rush into filing mode before ascertaining the true worth of the invention. Moreover, with PGR & IPR procedures it becomes very optimistic for a competent entity to invalidate a patent just after the grant because the matter is adjudicated by the PTO rather than in judicial proceedings. Apparently, there has been a cause of concern amongst filing community as now patents are being invalidated at an unreasonably high-rate (Section 4 (c) (3) of the Bill). Besides, in the pre-AIA regime, a grace period of 12 months before filing also covered acts of ascertaining the commercial value of the invention, such as sale, public disclosure to prominent investors, vendors and business entity. This was extremely pivotal for the inventors as it allowed them enough time to attract potential investors before investing their resource in obtaining a patent. However, in the post-AIA system, these acts can bar patentability of the invention and hence the inventor may ultimately end up risking her money due to lack of information pertaining commercial viability of her invention. Thus, it is highly likely for them to lose more than gain from getting a patent. Thus, this bill seeks to bring back the pre-AIA dissolve the distrust of the IP community in the system by becoming more investor-centric. Moreover, it also tries to bring a conducive patenting process for computer-related inventions, life sciences and other such fields, which may encourage start-ups and entrepreneurs to invest more into these application areas and ultimately boost the nation’s economy. The ultimate goal for which the Congress created the patent system was to ‘‘promote the progress of science and useful arts, by securing for limited times to authors and inventors the exclusive right to their respective writings and discoveries,’ (Constitution of US) and it is in the best interest of the US patent fraternity to create such a patent system where there is a balance between the inventors and public, where everyone has something to gain without sacrificing much. Nevertheless, the bill has already created a ripple for time to decide and the onus now lies with the Congress to continue or repeal the AIA system.